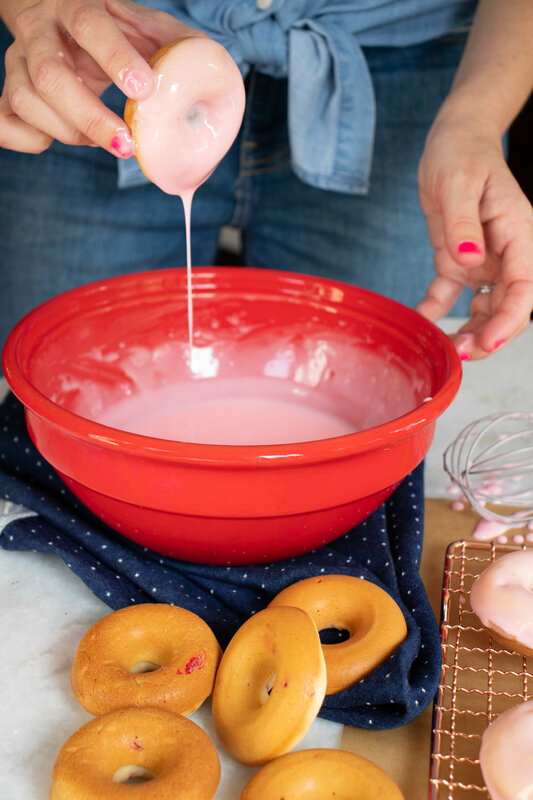 Concentrated maraschino cherry syrup boosted by a little amaretto in the glaze contributes to a nostalgic flavor and beautiful color in these easy-to-bake donuts. To create these warm, cake-like donuts, you just need a couple of donut pans, which trust us, you will use again and again and again. Not only are baked donuts easy to make, they are better dunkers and can endure rich, decadent glazes (yes, please!). If you ask us, it’s the glaze that makes the donut. These pinkalicious cherry donuts get double dipped in an amaretto cherry glaze and then topped with maraschinos. Preheat the oven to 350°F. Grease and flour two doughnut pans. In a medium bowl, whisk together the flour, baking powder, baking soda and salt; set aside. In a separate bowl, whisk together the milk, cherries, cherry syrup and almond extract; set aside. In the bowl of a stand mixer fitted with paddle attachment, beat the butter, coconut oil and sugar together until smooth, about 2 minutes. Add in the eggs one at a time and beat until fully incorporated, 2 more minutes. With the motor running on medium speed, add half of the flour mixture, then the milk mixture, and finally the remaining flour. Mix until just incorporated. Do not over mix. Transfer the batter to a large piping bag or Ziploc bag and cut a 1/2-inch opening from the tip. Pipe the batter into the donut pans about 3/4 of the way. Bake until the donuts are golden and/or until a toothpick inserted in the center comes out clean, 10-12 minutes. Transfer the pans to a wire rack to cool for 5 minutes. Remove the donuts from the pan and allow to cool completely before glazing. Make the glaze by whisking all ingredients together. If the glaze seems to thick, add a little more milk 1 teaspoon at a time. To glaze, simply hold the donut and dip one side into the glaze. Place glazed donut on a wire rack set over parchment paper (to catch glaze drippings). Once the glaze has hardened a bit, double dip all of the donuts! Sprinkle chopped maraschino cherries on top if using.